Students interested in learning more about the Udall Scholarship and other prestigious awards should contact Megan Friddle in Emory's National Scholarships and Fellowships Program. Find more information or schedule an appointment through the National Scholarships & Fellowships Program website. 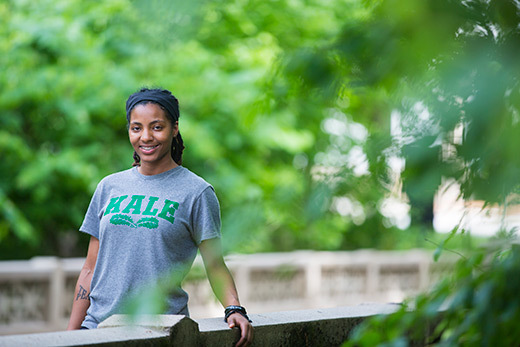 Emory College student Jamani “Roe” Montague Ox16 has been selected as a 2017 Udall Scholar. Her impressive list of accomplishments includes independent research into environmental racism, work as a legislative aide and youth coordinator for various political campaigns, and an internship working to solve civil and environmental issues as they relate to prisoners. The $7,000 national award from the Udall Foundation recognizes college sophomores and juniors nationwide for leadership, academic achievement, public service and commitment to issues related to Native American nations or the environment. Montague and the 49 other scholars from around the country will gather in Tucson in August to meet one another and interact with program alumni and leaders in environmental fields, tribal health care and governance. They were selected from almost 500 applicants. “This will be a great experience for me, to build on my environmental organizing skills and to strategize with experts and others who share my interests,” says Montague, an international studies major minoring in environmental science. She begins her senior year at Emory this fall and plans to pursue a PhD in environmental studies. Montague’s drive for service and leadership was unveiled when she was in high school in Newark, New Jersey, leading high school walk-outs in protest of a controversial district superintendent and working for progressive candidates for local and state office. She also was selected to participate in the highly competitive W.E.B. Dubois Scholars Institute at Princeton University during high school summer breaks. She would use the problem-solving training she received, specifically geared toward identifying and resolving pressing world issues, as soon as she arrived at Oxford College on Emory’s original campus. There, she began research with the Oxford honors program, examining the political economy of toxic exposure in U.S. public schools as well as the relationship between toxic exposure and academic attainment in minority youth. At Oxford, Montague was the president of the Black Student Alliance, president of Oxford Pride and community outreach coordinator for the Oxford Young Democrats. “She is energetic, articulate, experienced and mature beyond her years,” says Catherine M. Chastain-Elliott, Oxford’s associate dean for academic affairs. While at Oxford, Montague skillfully brought students, faculty and staff together in an effort that is now known as the Inclusive Curriculum Initiative. The ongoing effort works to find access to expensive course materials for low-income students and includes a rethinking of the Oxford curriculum to include more courses that reflect the cultural backgrounds of the diverse campus. Also at Oxford, Montague enrolled in a memoir class that included students from Lee Arrendale State Prison, a women’s facility in Alto, Georgia. She says taking a college course inside of a prison is what provoked her interest in prison policy and advocacy, particularly related to prison pollution. Her current research explores prison ecology, or the relationship between polluting prisons and the natural environment. Today, she interns for online grassroots activist website RootsAction, where she writes articles and petitions to expose the various environmental injustices experienced by people in prison. She spends much of her time calling radio stations across the country to give out her contact information so that prisoners with environmental problems can reach her. The work she does is personal. Her father was incarcerated two weeks after she was born. Every weekend she can recall from her first five years of life was spent in a prison visiting room. Today, Montague tutors at Lee Arrendale Prison, helping inmates with technical computer skills to take courses in a new associate’s degree program. She says getting to know those women helps her to better understand her father’s experience, such as learning prisoners often wait 45 minutes for a chance at a 10-minute phone call.